PENTICTON, B.C. — Team North America took its first lead of the 2013 World Financial Group Continental Cup, presented by Monsanto, on Friday morning. On Friday afternoon, they started to stretch that lead. 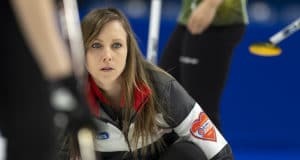 The home team in curling’s version of the Ryder Cup claimed four of the six singles matches against Team World on Friday at the South Okanagan Events Centre to take a 10.5-7.5 lead in the competition. A total of 60 points are up for grabs, with the first team past 30.5 points claiming the WFG Continental Cup. The bounce got higher with the performance in singles, which sees players throw a series of skill-testing shots with points awarded based on the end result of the shot. Team North America’s Heather Nedohin (Saville Sports Centre, Edmonton, Alta.) was a 17-11 winner over Team World’s Eve Muirhead (Dunkeld CC, Dunkeld, Scotland), thanks largely to back-to-back perfect shots from second Jessica Mair on the hit-and-roll to the button and lead Laine Peters on the raise-to-the-button. In the other women’s matchups, Team North America’s Allison Pottinger (St. Paul CC, St. Paul, Minn.) defeated Team World’s Margaretha Sigfridsson (Skellefteå CK, Skellefteå, Sweden) 18-13, while Team World’s Mirjam Ott (CC Davos, Davos, Switzerland) turned back Team North America’s Jennifer Jones (St. Vital CC, Winnipeg, Man.). In the men’s games, Team North America’s Glenn Howard (Coldwater & District CC, Coldwater, Ont.) was a 22-17 winner over Team World’s Thomas Ulsrud (Snarøen CC, Oslo, Norway), Team North America’s Kevin Martin (Saville Sports Centre, Edmonton, Alta.) topped Team World’s Niklas Edin (Karlstads CK, Karlstad, Sweden) and Team World’s Tom Brewster (Curl Aberdeen, Aberdeen, Scotland) beat Team North America’s Heath McCormick (Ardsley CC, Ardsley-on-Hudson, N.Y.). The second day of the 2013 WFG Continental Cup concludes with men’s traditional team games, beginning at 6:30 p.m. (all times PST, all draws broadcast on TSN). There will be nine more traditional team games (six men’s, three women’s), each worth one point for a win, and one-half point for a tie. All games are eight ends and there are no extra ends. For the six mixed doubles and six singles matches, one point will also be awarded for each victory, one-half point if tied. The six skins games (two mixed, two women’s and two men’s) on Sunday will offer a total of five points per game, with the first six ends of each game worth one-half point each, while the seventh and eighth ends are worth one point each. In skins, a count of at least two with last rock or a steal is required in order to win an end. Otherwise, the points carry over. The winning side receives $52,000 Cdn ($2,000 per member, including captain and coach), while the losing side gets $26,000 ($1,000 per member, including captain and coach). As well, the side that generates the highest points total from the final three skins games will receive an additional $13,000 ($500 per player, plus captain and coach). Each side has won four Continental Cups; Team World prevailed last year in Langley, B.C. Here is the remainder of schedule for the first three days of the competition; matchups for the six skins-format games that could decide matters on Sunday will be determined when the respective coaches and captains (coach Rick Lang of Thunder Bay, Ont., and captain Kelley Law of Coquitlam B.C., for Team North America; coach Peja Lindholm of Östersund, Sweden, and captain David Hay of Perth, Scotland, for Team World) meet on Saturday afternoon. • For ticket and other event information, visit www.curling.ca/championships/continentalcup. • TSN, the exclusive television network for the Canadian Curling Association’s Season of Champions, and French language sports network RDS/RDS2 will provide complete coverage of this year’s World Financial Group Continental Cup, from the Opening draw (Women’s Team games) on Thursday morning through to and including the final Skins games on Sunday. 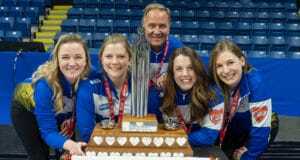 • The World Financial Group Continental Cup is a joint venture of the Canadian Curling Association, United States Curling Association and World Curling Federation.